Arab, as the name suggests, plays on the Arabian peninsula. A very exciting variant demanding lots of diplomatical talent. 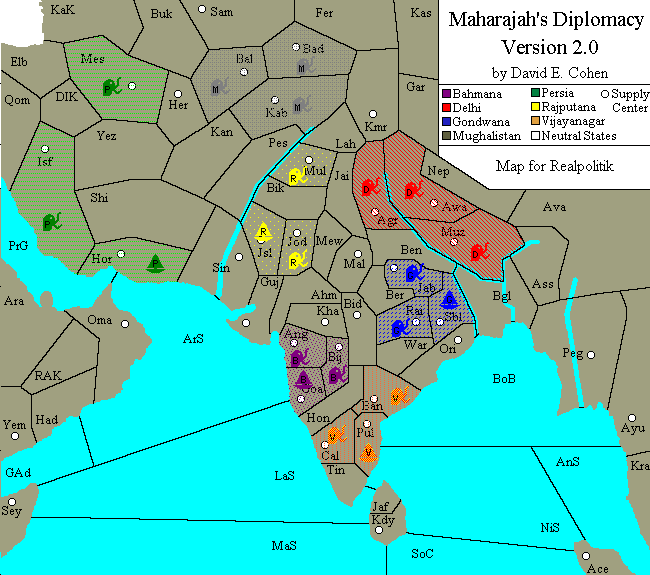 Maharajah: Set in the Indian subcontinent David E. Cohen has created a very challenging variant. While the variant still feels like Standard, there are some interesting new rules like navigable rivers, that allow for convoys und conquest of new home scs. Selfmade: Oceania is the newest gS variant offering lots of new features to those willing to test it. The most interesting new feature probably is the possibility to directly hop between islands with an army (no fleets needed). Before playing this variant better take a look at the info text. Granted this map isn't exactly a feast for your eyes, but don't let that distract yourself from the fact that Youngstown is a very interesting variant, that even allows travelling around the globe with its offboard boxes. 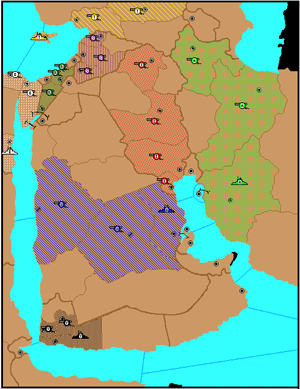 This 8 player variant was developed in 1990 during the Iraqi invasion of Kuwait. Set at and around the arabic peninsula it illustrates that there is not much room in this region of the world. To play this variant you will definitely need good nerves and a lot of trust for some of your fellow players. For more details take a look at Roland Isakssons Website where you can find out more about geographical features and as well will find lots of EoG's. 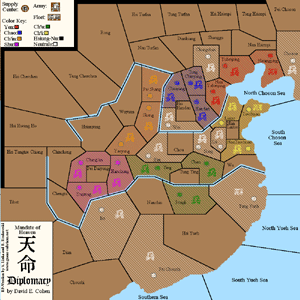 Asian Diplomacy IV by David Lawler, Peter Baer and Pitt Crandlemire. 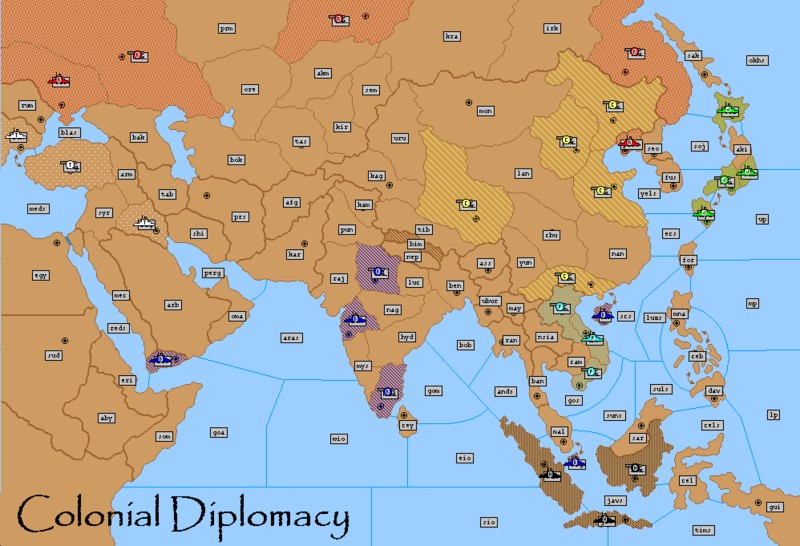 Adapted for Realpolitik by René Linka and Frank Bacher. 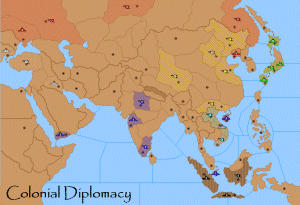 This variant is a plain map-variant of Standard Diplomacy / Colonial Diplomacy without a specific historical foundation. 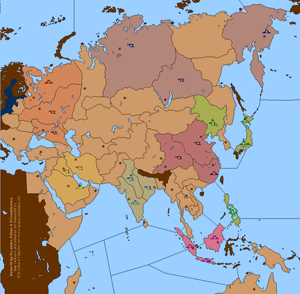 Seven Nations (China, India, Indonesia, Japan, Russia, Sibiria and Persia) struggle to dominate Asia in the beginning of the 20th century.Without special rules this map is maybe simply a better Colonial. The only commercially published variant, set in the Far East and Middle East, begins at the end of the colonial era in 1870 and features the following nations: Russia, Turkey, Japan, China, Dutch East-India, French Indochina and the widely stretched British Empire. As the placement of units and and names in the original RP variant files were very confusing we modified these and offer you our enhanced version for download here. Always wanted to have some battles on the Indian subcontinent? Well here you go;-) The basic feeling of Maharajah is very similar to Standard though you won't be bored by the new map which makes life for some a bit harder. Rule changes include convoys on the navigable rivers, possible additional home supply centers and slightly more supply than in Standard (37). Please take care while adjudicating with RP because not all new rules are playable with RP. Mandate of Heaven © David E. Cohen, adapted for Realpolitik by René Linka and Yvonne Linka. 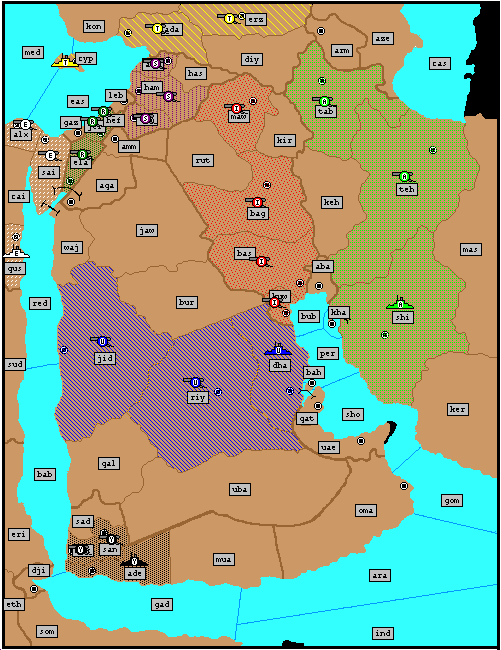 This map and rule variant has some really interesting features. It begins 369 B.C. and is set in China. Specials include a nomadic power, starting the game without actually owning an sc, navigable rivers and last but not least armed neutrals who will do whatever a majority of the players with a majority of units on the board tells them to do. If one of these neutral powers grows to 3 or more sc's a new(!) player will be called in to take over the former neutral power. If a unit is completely surrounded by enemy forces it has to be attacked with one more unit than in a "normal combat" where valid retreats are possible. For more detailed information please refer to David E. Cohens Website Diplomiscellany or the infotext. 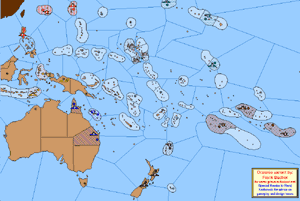 Oceania is a seven player Diplomacy variant. Not suprisingly, Oceania consists of lots of island chains. These chains have some special characteristics. Basically two different types of island chains exist: Chains with only one space (e.g.Pitcairn Islands (pit) and so called multispaced island chains (e.g.Solomon Islands (nsi/ssi). 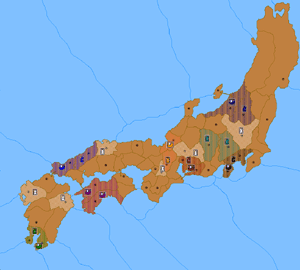 The most important feature is that armies can move _directly_ from one island chain to another ("island hopping") as long as both chains (independent of being multispaced or singlespaced) border the same sea province. This feature is restricted to armies. The reasoning behind these rules is that in our time movement from one island chain to another is easily possible by air, be it helicopters or water planes or whatever. Consequently fleets can't be transported by air and have to move between Island chains at "a slower pace". Here you find the original info-text of this variant and the download of the Realpolitik variant-files. If you wish to contact the designer send e-mail to: bacher@graue-substanz.net; Any questions, comments and/or suggestions are welcome. 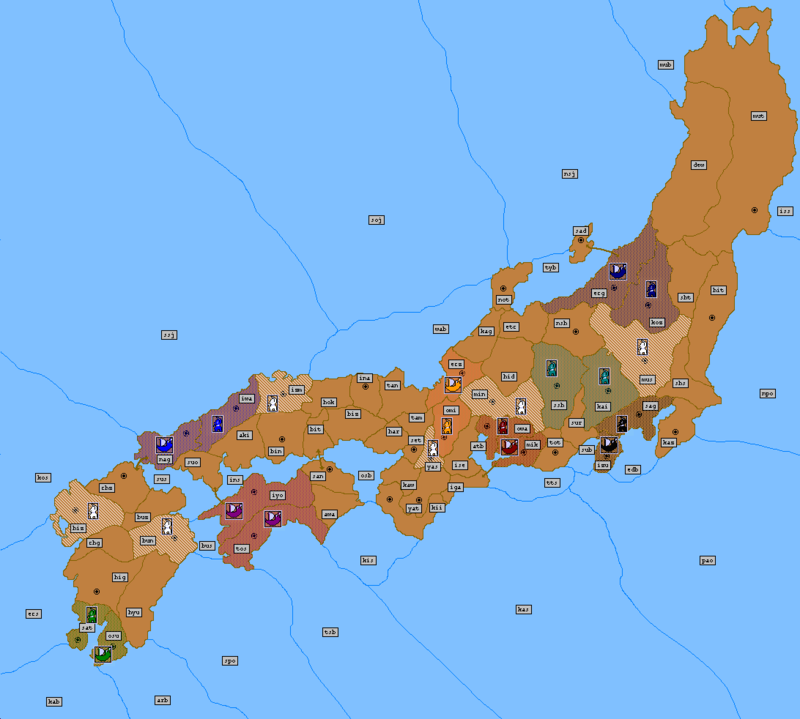 Sengoku is an eight player variant set in the Japan of the 16th century. It features 8 holding neutrals which can be supported while holding but cannot move. 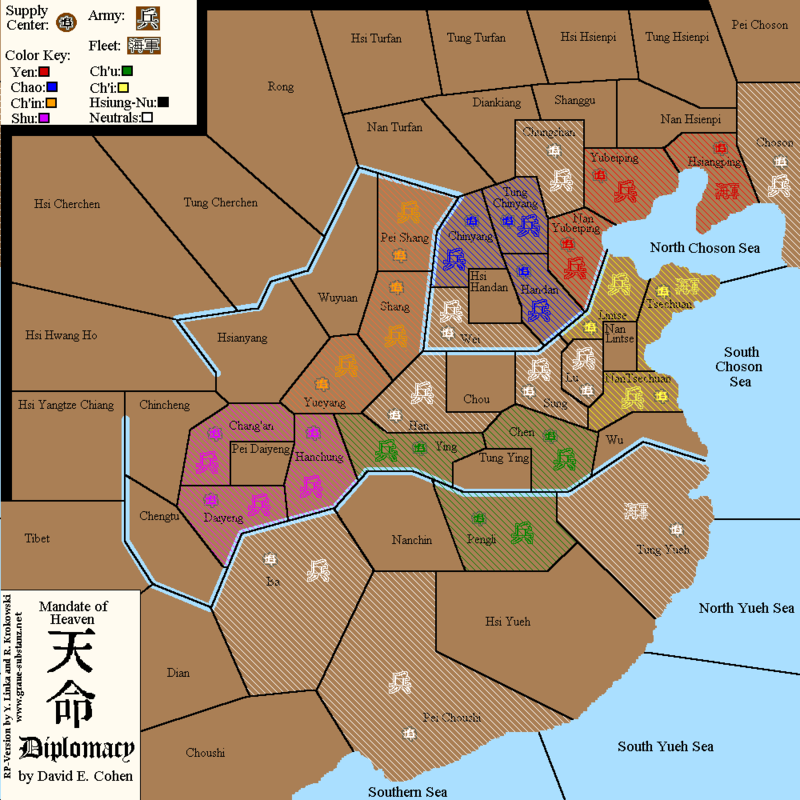 Sengoku is played in chaos build mode what means a player can build in any previously owned center without regard to whether he still possesses a home center or not. Drawing or sharing victory isn't possible in this variant. In case that the players draw the game the GM chooses a winner as there can only be one Shogun! South East Asia by Andrew Reddaway. Placed for disposal by Steph Mabie. 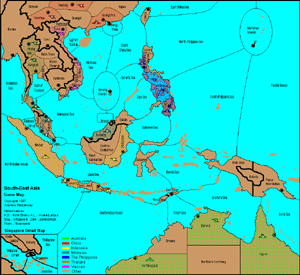 Basically the same as Standard Diplomacy (as far as rules are concerned) , South East Asia starts in Spring 1997. China is politically und economically unstable with lots of potential conflict zones all over Asia. This variant only has few neutrals (11) what makes it essential to start tactically and diplomatically careful. The motto "Stab you soon" will become rather sooner than later reality while playing this very interesting variant. 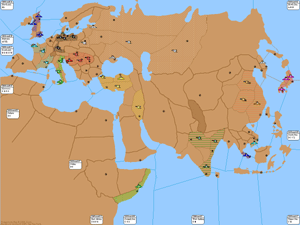 This 10 player variant contains the standard map with slight modifications plus Asia and the northern and eastern parts of Africa. New powers are China, Japan and India. To travel from one side of the globe to another there are Offboard boxes who bring you for example from Japan directly to the North Atlantic. This variant is part of the Realpolitik download but once more some minor issues had to be fixed.